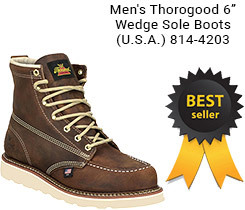 THOROGOOD WORK BOOTS and SHOES and have been manufactured by Weinbrenner Shoe Company since 1892. Thorogood has become a trusted source for everyday work boots, wellingtons, hiking boots, postal shoes, uniform boots, waterproof boots and insulated boots. A large number of these Thorogood boots and shoes are still made in the U.S.A. at Weinbrenner's Merrill and Marshfield, Wisconsin factories by highly skilled American workers. The most popular of these USA made Thorogood styles are from the American Heritage Wedge Sole Collection. 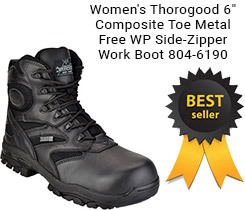 Here at ThorogoodWorkBoots.com we are happy to showcase the high quality Thorogood brand. Thorogood Boots and Shoes are quickly growing in popularity due to high quality components and top notch craftsmanship. Several of the Thorogood boots and shoes incorporate valuable technologies such as Sympatex® waterproof barriers and bloodborne pathogen compliant barriers, Thinsulate™ Ultra Insulation and Vibram® rubber outsoles. It's not hard to see why Thorogood Boots have become the first choice for many police officers, EMTs, iron workers, postal employees, oil & natural gas workers, and manufacturing employees. charges apply for APO/FPO, Alaska and Hawaii shipments. Please click here to view pricing. We currently only ship to USA locations. ThorogoodWorkBoots.com by Authorized Dealer MidwestBoots.com 2018. All Rights Reserved. Thorogood's logo, text, graphics and photo images are the property of Weinbrenner Shoe Company, Inc. and are used with permission.